Sometime CCBoot clients can get multiple IP. One from CCBoot DHCP server and one from other sources (Figure 1). When this happens, client can still boot normally but sometime may have issue when booting. If client has issue booting then we need to solve this. 1. Make sure that there are no other DHCP running on your network and only CCBoot DHCP server is running. If there are any, please disable them (specially router dhcp). 2. If client has issue booting then check that DHCP is enabled in client PC. please refer to "Set the DHCP Client" for solution. 3. Install latest version of CCBoot on your client in superclient mode. The latest version has a patch for windows 7 which fixed the multiple IP issue. Note: You need to have windows update enabled when you install the new version. If you have windows update disabled, then the Windows 7 patch will not be installed and the multiple IP issue will persist. 4. 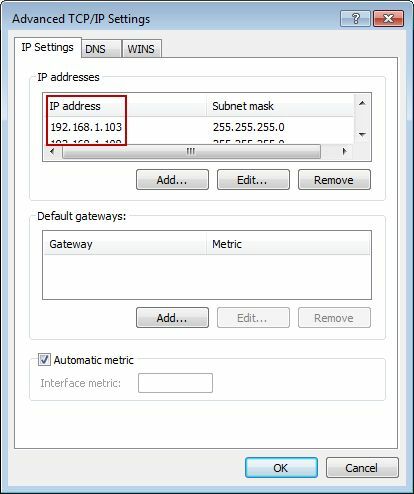 Set static IP in the client before you upload the image.